The unique villas at COMO Cocoa Island are inspired by dhoni boats—the traditional wooden vessels used by local fishermen. Rustic on the outside and refined elegance within, each dhoni suite has its own private terrace so you can slip right into the Maldivian Sea with ease. A personal butler caters to all you needs and you can have delicious South Indian fare delivered directly to your door. Luxury awaits at this five-star resort set along a mile long stretch of beach and mangrove in Mexico’s Riviera Maya. A picture of isolated serenity, the deluxe overwater lagoon suite at Rosewood Mayakobá floats peacefully atop the lagoon’s emerald waters. This one-of-a-kind suite includes a swim-up lounge terrace with a plunge pool, a luxurious bathroom with an outdoor garden shower, and of course, unrivaled views of the lagoon. Perched on elegant stilts over the Strait of Malacca, Pangkor Laut’s iconic overwater villas are decked out with spacious balconies, oversized tubs and outdoor rain showers. Located in what some call The Maldives of Malaysia, the resort is nestled amidst an ancient rainforest on a private island surrounded by white sandy beaches and shimmering emerald waters. A true paradise in the middle of the Caribbean can be found at Punta Caracol in Panama. This rustic eco-lodge offers sustainable cabin dwellings with direct access to the crystal clear waters below from each private terrace. A 30-minute boat ride from the nearest town, the Punta Caracol cabins are truly isolated, making the experience here all the more peaceful. Stunning bungalows and tranquil spas make up the legendary Four Seasons Bora Bora resort, set in the shadows of the breathtaking Mount Otemanu. When you rent a bungalow here, you can sip champagne from your private plunge pool, soak in the Tahitian sunset, get your meals delivered by canoe or even enjoy a massage while peering down at the stunning sea life below through a glass floor. Soak in the pure tranquility of the ocean at this luxury set of villas. The modern, airy villas open up onto private decks with wrap-around hammocks where you can sunbathe by day and enjoy the Maldivian sunsets by night. Or you can opt for an even more luxurious overwater villa complete with a private infinity pool and jacuzzi. Perched on the edge of a vibrant coral reef, suspended over the pristine Likuliku Lagoon lies a set of isolated bungalows built out of natural elements from the region. These bungalows, also known as “bures,” are elegant and stylish with unique design flourishes and all the amenities you’ll need. Lay back on your private deck or luxuriate in your attached bathing pavilion with lagoon views from the tub. 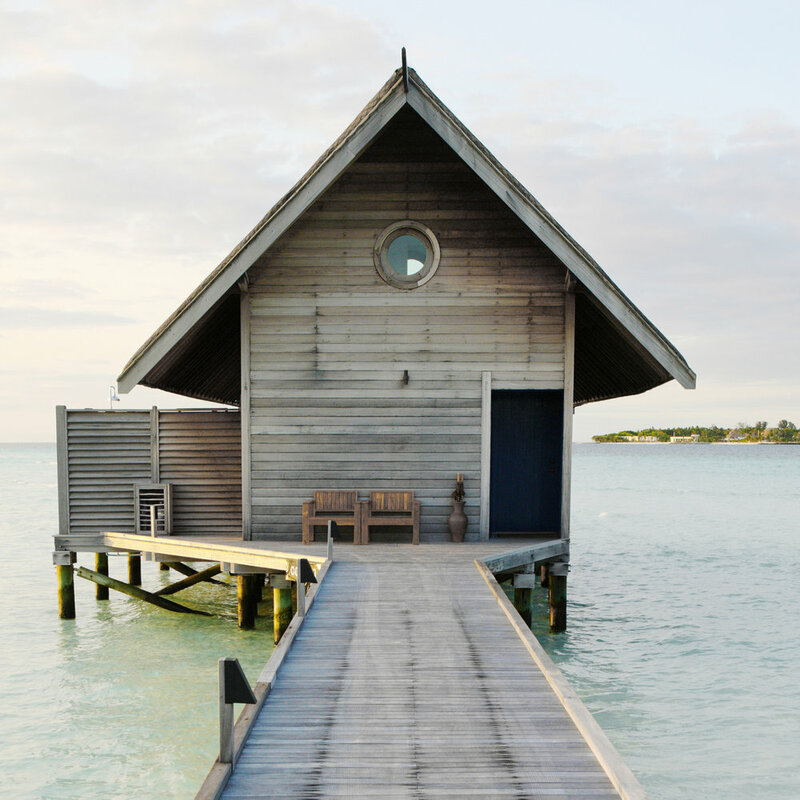 It may not be in a tropical climate but Hôtel Palafitte was too beautiful to skip over. The hotel is made up of a group of modern pavilions suspended on stilts over the tranquil lake Neuchâtel in Switzerland. The simple yet sophisticated pavilions are the perfect romantic destination year round, with ladders suspended from each providing direct access to the lake and small terraces with breathtaking views of the lake and the Alps.